We announced today an Art Exhibition featuring Artists with disabilities hosted by the Alhambra City Hall in Alhambra California, which will be on display during the entire month of February 2019 at the City Hall Lobby. 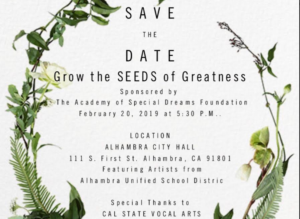 The exhibition will feature original paintings, and other works of art by local artists and many other artists from Alhambra Unified School District. 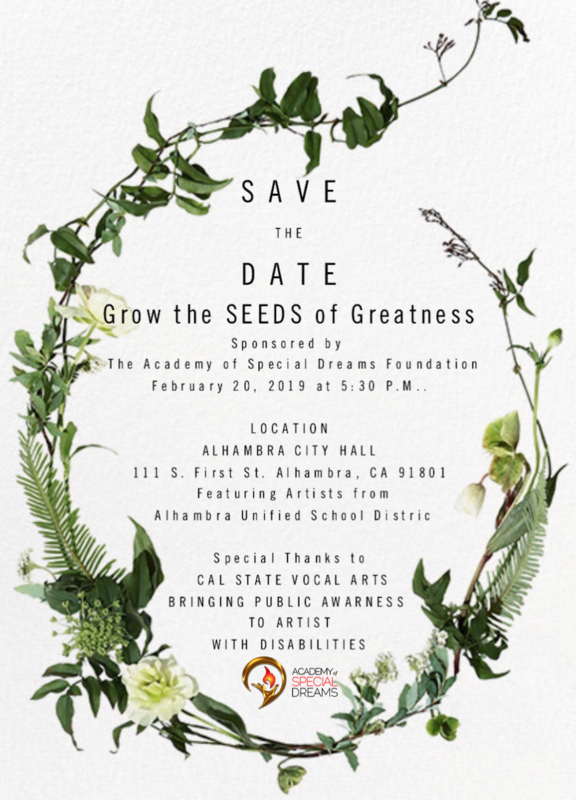 We give many thanks to Alhambra Unified School District, The City of Alhambra and all friends and supporters of the Academy to give us the opportunity to showcase the creative talents of artists with disabilities in our community. Special Thanks to CAL State Vocal Arts! Thank you for your talented support and dedication to make a difference in our community! Join Us for a Reception on Wednesday February 20, 2019 at 5:30 P.M.
“We believe that all persons, regardless of their disabilities, should have equal opportunities to express their talents and to be successful in the Arts,” said Michael Dergar, President and CEO of the Pasadena-based Academy of Special Dreams Foundation. This Art Exhibition is another opportunity for us to encourage, promote and showcase the artistic expressions of these amazing artists from around the country. We give many thanks Wendy Osawa, Academy Board Member and Teacher from AUSD for her dedication and support to make this event a memorable event.